Just popping in to show you some photos of Nat and I at the recent Niche Market. 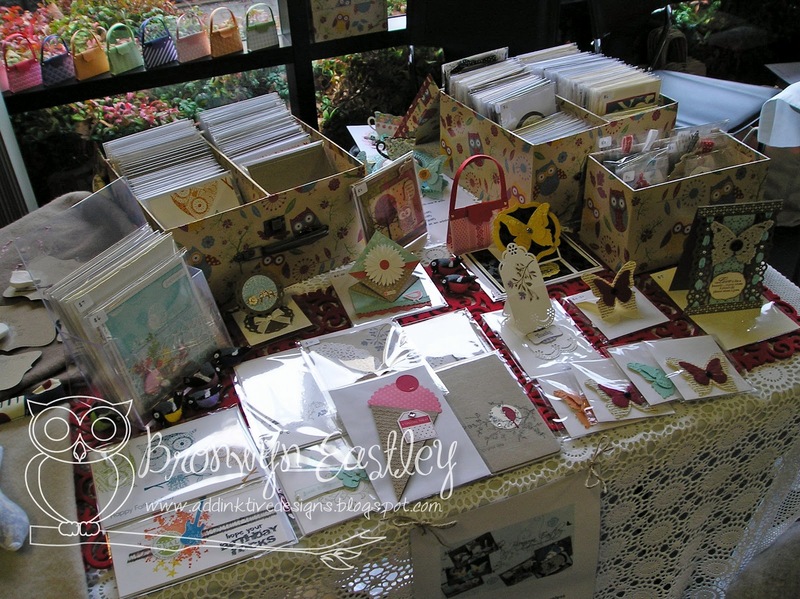 We had a lovely time on Friday evening and Saturday selling soft furnishings and paper craft at our stall. Thanks to all our friends that stopped by to support us in this little venture. 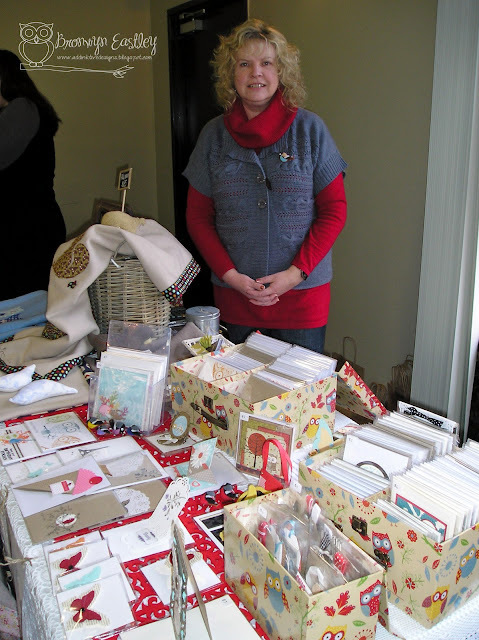 Nat's gorgeous woollen baby blankets, soft toys, rattles and brooches. Beauty on High, 34 High Street, Launceston. Thanks for stopping by. I am technically on a blogging break but thought some of you would like to see some pics of what has been consuming all my spare time of late! It's now time to clean up the house, get some food in the cupboard, spend some time with my family, enjoy a tropical holiday and 'smell the roses blossoms' before concentrating on writing some curriculum for school. Good times ahead! Remember my 'Totally Tags' demo in July? 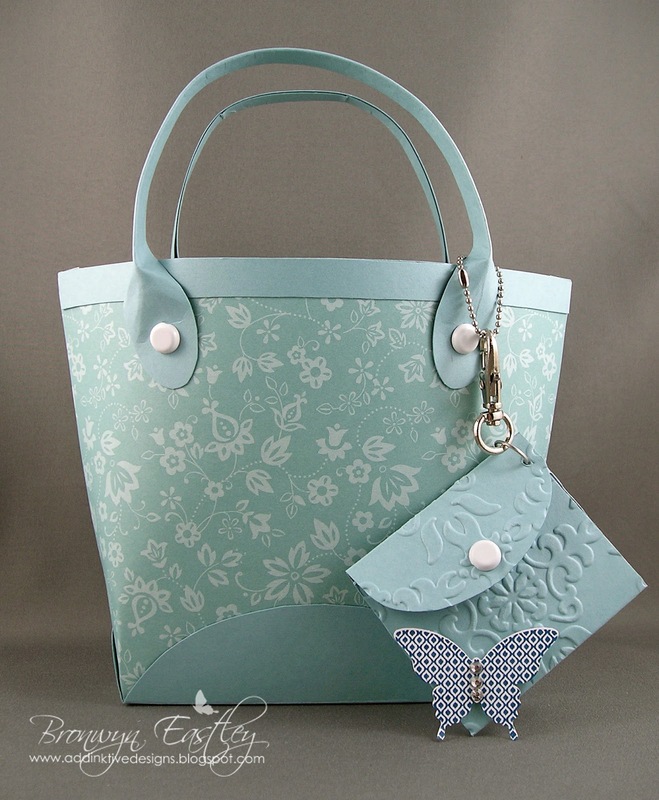 This is the very last example that I have to share with you in that series. 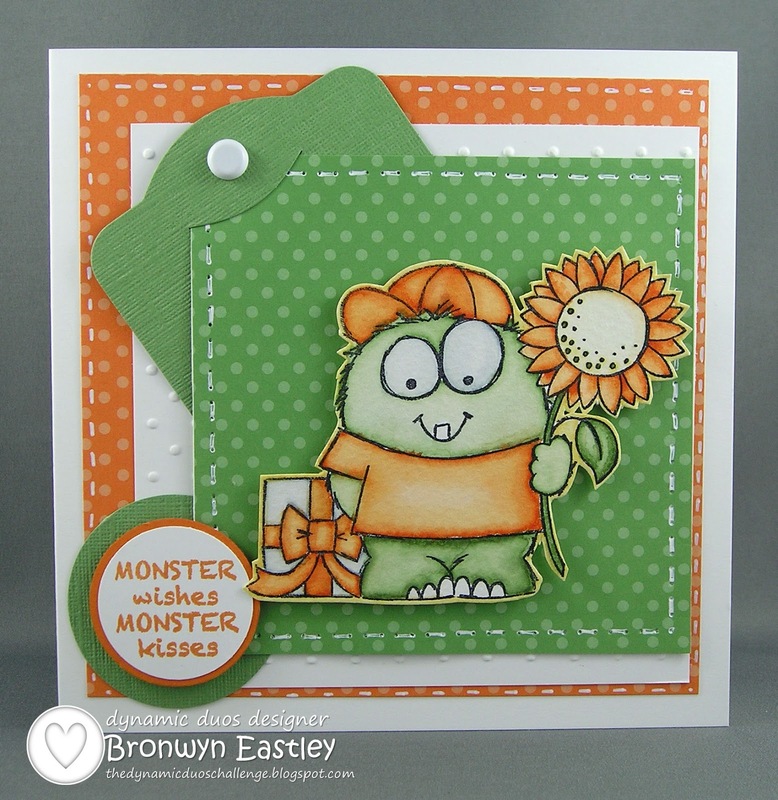 It was made using the latest challenge colours for Dynamic Duos. The Black Tie Challenge this week is to use River Rock and Basic Black in your project with Brads as a Dessert Option. 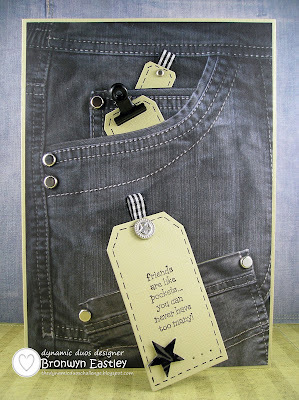 My card was made from a sheet of paper from the Denim Bloc pack by Joy Crafts. The 'black denim jeans' were perfect for the option of adding brads (3 different SU ones used in this project). 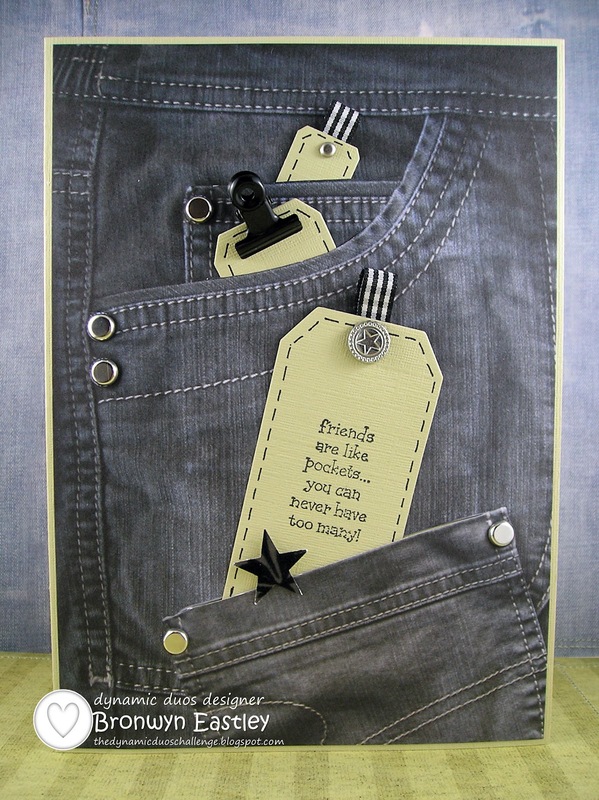 The River Rock tags were made from textured card stock using the three sizes of tags from the Nestabilities dies from Spellbinders and stamped with the sentiment from Pocket Fun (SU-retired). 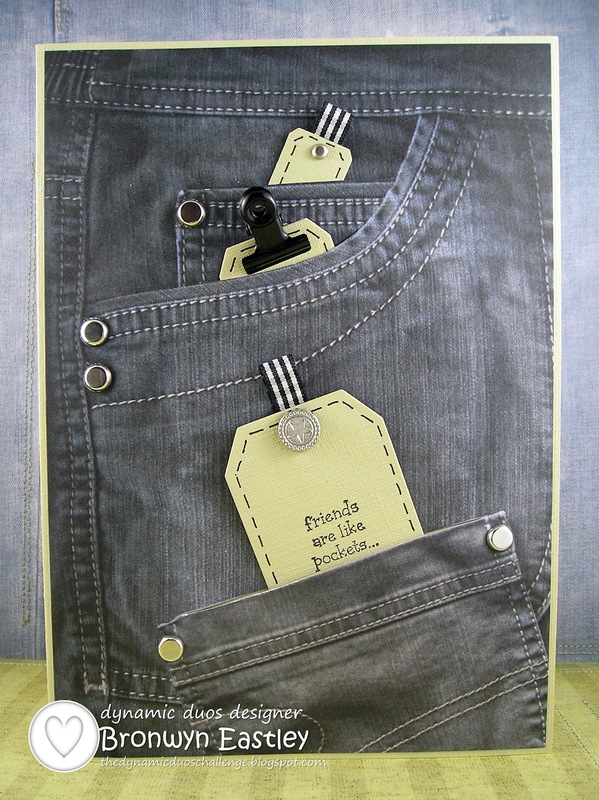 I used a craft knife to cut along the edges of the 'pockets' and placed a foam dot (dimensional) on the inside of both sides of the pocket, just below the opening to allow for easy access for the tags. Thanks so much for taking the time to stop by. 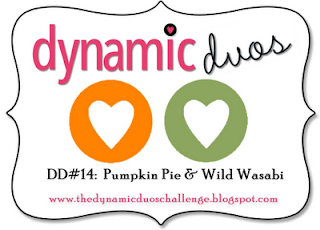 I hope you can join us this week at Dynamic Duos. I've decided to have break from blogging for a while and this also means that I have stepped down as a Design Team Member with Dynamic Duos and Just Add Ink. My love of card making hasn't diminished but work commitments have stepped up a notch with the need to spend more hours at home working on implementing the Australian Curriculum, changing the way I document my planning, evaluation and reporting. I teach at a small Independent Christian School and this whole process requires an audit of the curriculum that we currently use. It's a busy time but thankfully God has renewed my passion for teaching (I was almost at the point of 'chucking it all in') but instead I'm looking forward to working through this transitional phase. On another note, it's almost Spring in Australia, a new season to look forward to and also the start of a new 'decade' for me as I turn 50 and celebrate this milestone with a holiday to Fiji with hubby. I appreciate all those people that stop by my blog and leave some comment love, who keep on buying my tutorials (I feel so blessed) and send me lovely emails. Thank you. This isn't a goodbye ... as I know I will be back at some stage. 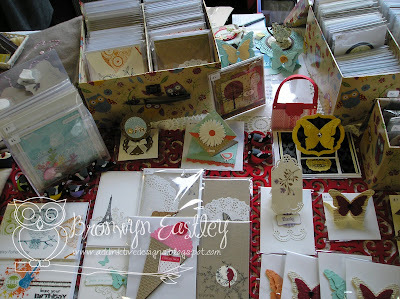 So until then ... happy crafting! 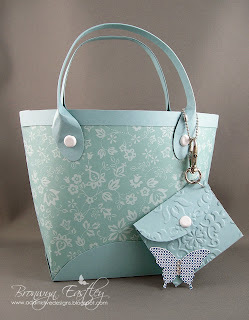 There's an awesome challenge at Just Add Ink this week to Just Add Blue and Bling! 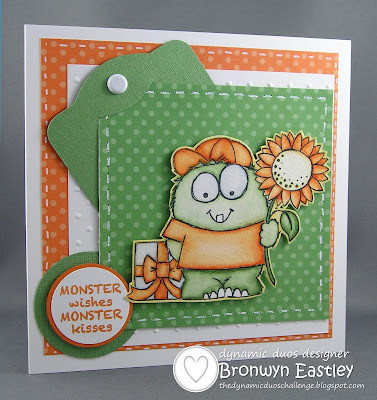 I'm a bit snowed under at the moment with various commitments and wasn't able to put in a DT project for JAI #130. However, it occurred to me while I was making this little Haute Tote, that it fitted the criteria for this week's challenge, so I am playing along for fun and to promote one of my favourite challenge sites. Hope you can join in too. Challenge ends 10pm on Wednesday (AEST time). 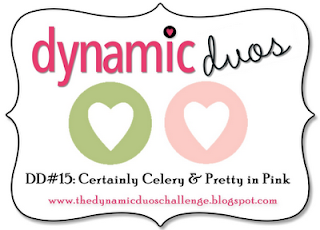 It's a soft and subtle colour combo at Dynamic Duos for week 15 - Pretty In Pink and Certainly Celery. 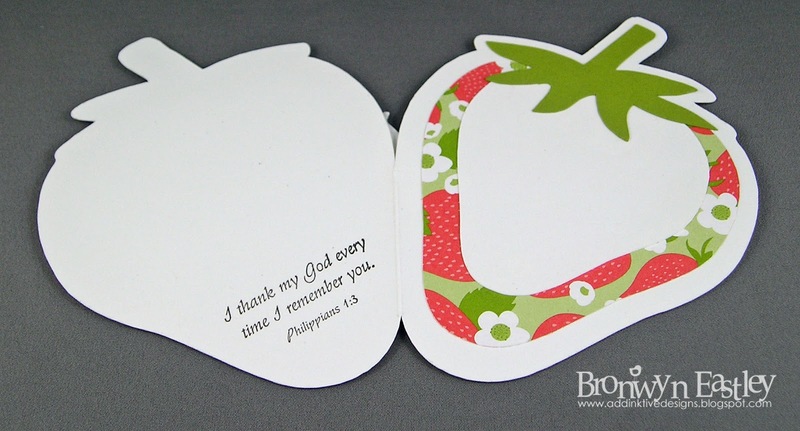 A friend holidaying in Canada was able to send me some cute new Stampin' Up! goodies which arrived in the post just in time for me to put this card together. 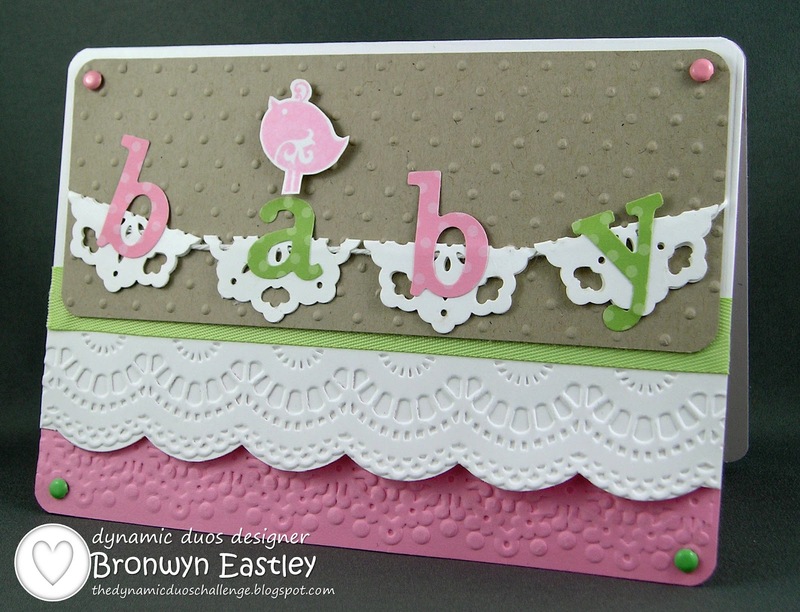 There has been a bit of a 'baby boom' lately. My mum has been busy knitting little jackets or jumpers for me to give as presents and I'm trying to catch up on the card making. This one was made to welcome Lucee Joy, first grandchild for friends of mine. 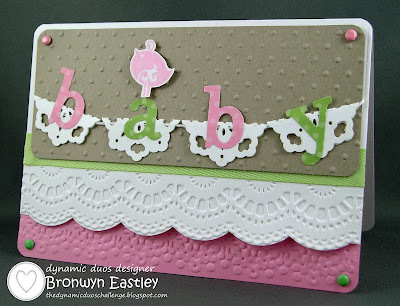 I have used the cute little bird image from the new stamp set, Baby Boutique and the new large scallop edgelit die and co-ordinating Delicate Designs embossing folders. 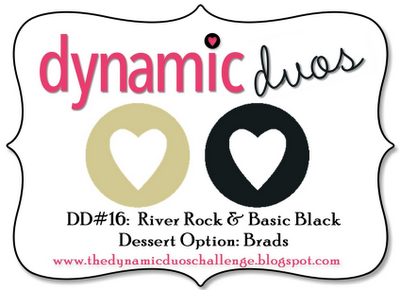 It's a Bold and Sassy colour combo this week at Dynamic Duos. 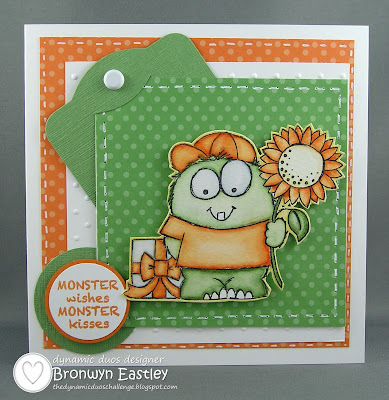 I must admit that orange and green are on 'my list of least favourite colours' but I was surprised at how awesome the combo turned out to be and just how much I enjoyed making this card. It must have something to do with that little monster image. Isn't he adorable? This is the first time I have inked up my Lil Monster Valentine. In my opinion he gets an Olympic Gold Medal for 'cuteness'. I decided to do a bit of water colouring with my SU Markers and Aqua Painters. I found it was a relaxing way to pass the time while babysitting for friends a couple of weeks ago. 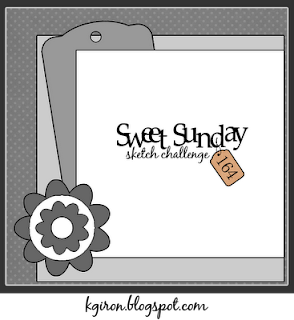 Matching SU DSP, embossed white card stock, tag, sentiment and faux stitching were added using the latest Sweet Sunday Sketch Challenge for inspiration. 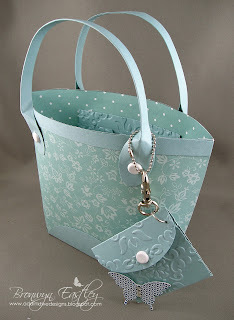 Last, but by no means least, I am entering my card in the 'Flower Frenzy' August challenge at Stamp, Embellish, Create. I love my Silhouette Cameo and it is certainly came in handy for the latest challenge at The Lollipop Ladies. 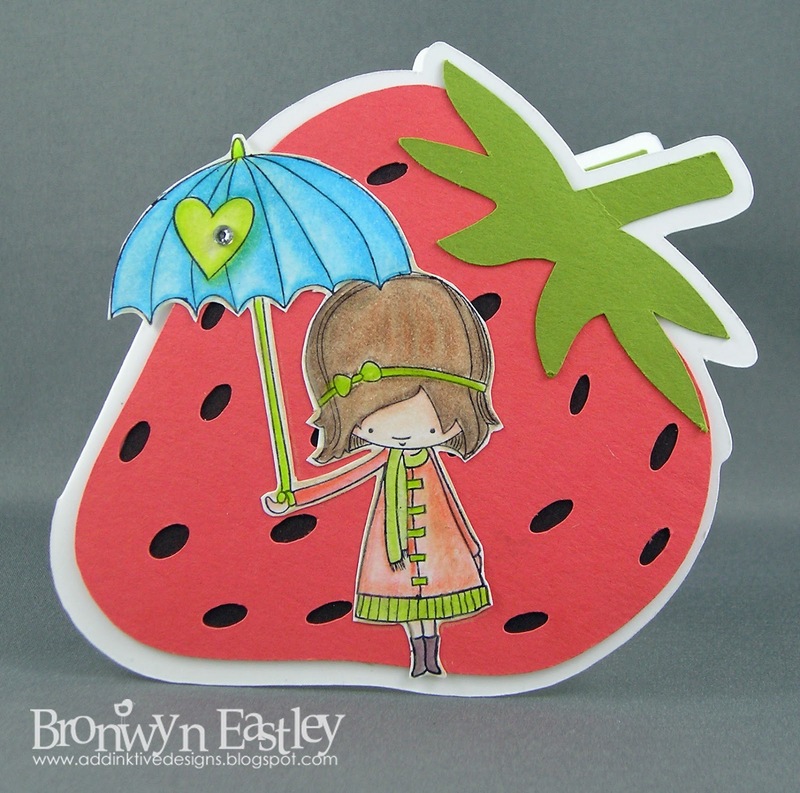 The sweet image on the front of my strawberry shaped card is from a set called, 'A Beautiful Day' by Annabelle Stamps. 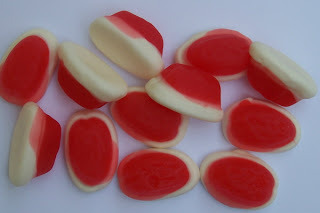 Strawberry + Cream! for your inspiration. With the additional challenge of Layers. PS: August is a very busy month for work so I'm saying goodbye to The Lollipop Ladies as a DT Member today. Please forgive me if I don't get the time to stop by and leave some 'comment love'.